The Board of Education and administration regularly monitor class sizes, but especially during the spring and summer as projections are revised to become actual numbers. Updated enrollment reports are presented to the Board of Education in the fall and when the Board is involved in its budget preparation for the next fiscal year. In December, the administration begins developing preliminary enrollment projections for the upcoming school year. State law then requires every Illinois school district to make most staffing decisions for the following year in March, based on budget and enrollment projections. In the spring, the District works with its staff to problem-solve areas of concern. It is not until late summer that class sizes in all grade levels are better known as projections become actual numbers and student registrations are confirmed. In Batavia Public School 101, staffing levels are adjusted every year based on enrollment projections, even in years when large program expenditures or budget changes are not under consideration. The administration annually modifies staffing levels because BPS101’s elementary school population has declined 16% since 2012, which equates to approximately 460 less students. In a fiscally responsible approach, fewer students require fewer teachers. Staffing reductions may also be linked to a decreasing revenues, such as a lower Consumer Price Index, losses in state funding or reimbursement, or other related financial and enrollment factors. Throughout the year but especially during the summer, families move in unexpectedly, other families relocate out of the area, and students may transfer between buildings or to the John C. Dunham STEM School. These are some of the many scenarios that typically occur. In fact, special programs and transfers sometimes can help maintain other class sizes within guidelines. As a result, it isn’t until late summer that enrollments begin to crystallize and staffing needs are better known as projections become actual numbers. Adjusting teacher assignments and class sections before these variables are better known would be premature. This is especially true in the area of kindergarten sectioning. Although the potential instructional benefits of smaller class sizes are generally acknowledged by practitioners, Illinois is one of 11 states that do not limit the number of students in a regular education classroom through the school code. Taking into account various conditions and enrollments from year to year, the Board of Education’s collective bargaining agreement with the teacher’s association establishes a general guideline or goal of 22 students in a grade K-2 classroom, 26 students in a grade 3-5 classroom, and 30 students in a grade 6-12 classroom. These long-standing guidelines are unique to BPS101, although the ranges are comparable to those used by surrounding districts. Guidelines are agreed-upon general parameters the administration follows to balance class sizes, staffing, instructional and budgetary needs. 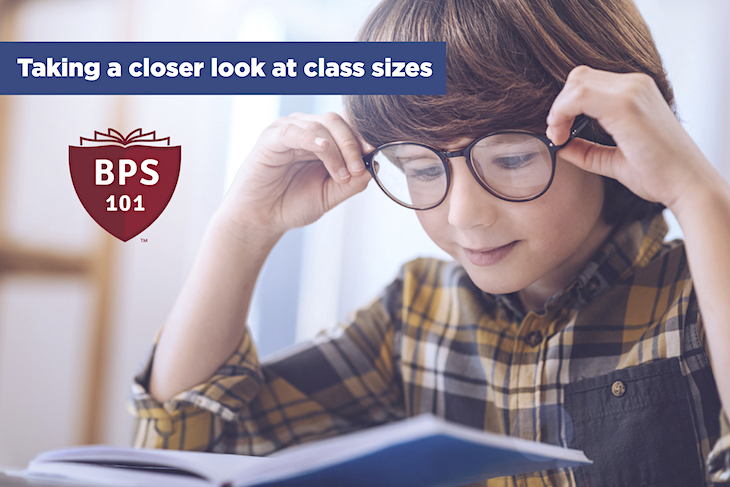 A cap—which BPS101 does not use—would be the maximum number of students allowed in a classroom before taking specific measures to reduce a class size. For example: two second-grade classes in one building are filled with resident students, and the class sizes are capped at the present top of the guideline: 22 and 22. If one more student in that grade level moves into the school’s attendance area, the cap would be exceeded. One of two scenarios would need to occur at that point: (1) the last student to enroll would be required to attend another school where class sizes are below the cap; or (2) a new classroom, or section, would automatically be added, which would create three sections at 15, 15, 15. That would, of course, require another teacher and another classroom. While space might exist to add sections and teachers at times in certain buildings, it would not consistently be an option without transferring some resident students to another building, creating grade-level centers or adding mobile classrooms. While a class-size cap would result in smaller class sizes, the financial impact would be significant. In the previous example, the additional student would increase staffing costs by 50%. Multiply this several times across the district and the implications of a class-size cap policy become evident. In addition, if such a strict rule were enforced, sections would not likely be finalized until early August, placing families on an emotional roller coaster as they wait to learn which school their child might attend in the upcoming year. General guidelines on class sizes impose fewer budgetary restrictions and allow more flexibility when assigning staff. When students move from outside the District into a school attendance area, when they move from one attendance area to another, or when they exit a District-wide program, it is the District’s practice to allow them to attend the school in their home attendance area. When special-needs students qualify for a specific program at another school, it is the student’s right and the District’s legal responsibility to ensure participation in the program even if it is housed in a different school. The District is committed to supporting learning and growing. When a class exceeds guidelines, there are varying levels of support that are offered depending on student needs. Other students also move in and out of a classroom during the course of a typical day—causing elementary class sizes to decrease or increase—such as those in band and orchestra, extended (i.e. high-ability) education, interventions, and flexible grouping for individualized instruction.